‘Brooklyn Nine-Nine’: Series Premiere Review | Wait! What's A Dial? This time, he plays a goofy detective on Fox’s new police comedy Brooklyn Nine-Nine. 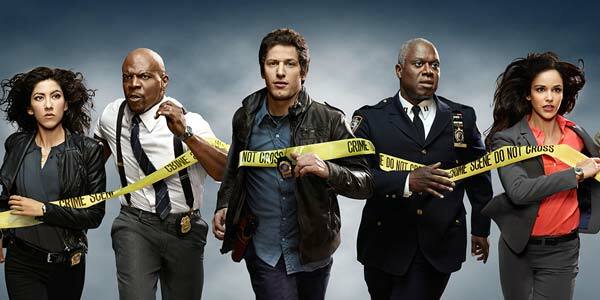 Samberg re-teamed with SNL writer/producers Lorne Michaels and Michael Schur (The Office and Parks & Recreation) for the new show that follows the misadventures of Detective Jake Peralta and his fellow officers as they try to keep the streets of Brooklyn safe. The show features many familiar faces including Terry Crews (The Expendables) as an action fearing Sergeant and Andre Braugher (Men of a Certain Age) as Capt. Ray Holt. Nine Nine tries to mash two different genres of television together: the workplace comedy and the stereotypical police procedural. The pilot succeeds in combining the two tired genres and puts a new twist on tired cliches and stereotypes. The immature detective has a crush on his fellow detective, but they are also rivals. The tough as nails Captain is actually gay and has a sense of humor. He isn’t there to simply make rules and regulations for Samberg to ignore and disobey. The supporting cast members are very diverse and seem to each bring something different to the table. While the pilot wasn’t the funniest thing I have ever watched, it was still an enjoyable show with a lot of potential. The series creators have a great track record with comedies, so hopefully Samberg and company continue to develop this series into a hit for Fox. With the reviews that Dads is getting, they may need it to be. Posted on September 18, 2013, in Comedy, Fox, Primetime, Sitcoms and tagged amy poehler, andy samberg, brooklyn nine nine, comedy, fox, jason sudeikis, kristen wiig, Lorne Michaels, michael schur, New Series, pilot, saturday night live, snl. Bookmark the permalink. Leave a comment.